We have two fun classes coming up this week. On Friday, July 29, from 10am-12pm we are having one of our quick and easy knitting loom classes. Come and join us to learn to create an alpaca scarf using a knitting loom. No experience or fiber art skills necessary. For more information, click here. Saturday we will be working on the second square of the Great American Afghan. 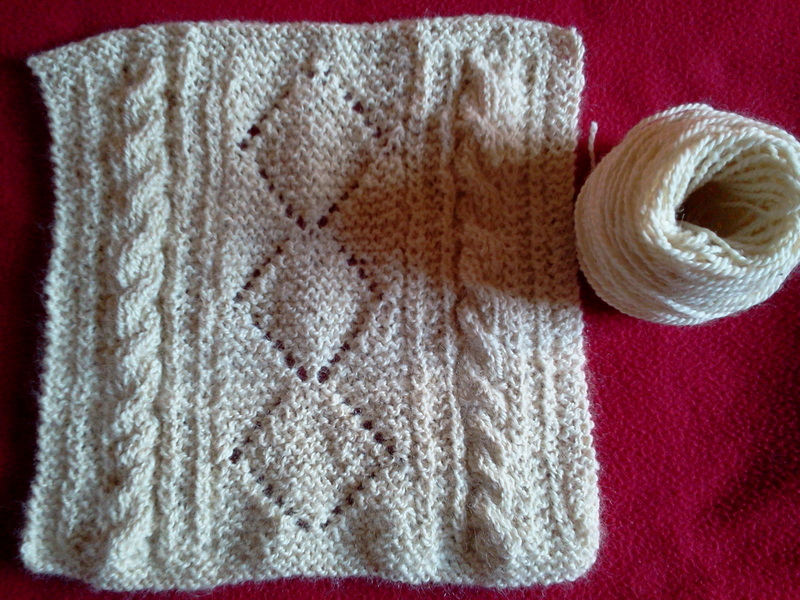 Pictured here is the first square we worked on, knit by Carol Dixon with one of our alpaca yarns. We will be starting on a new square this Saturday from 1-5pm, so feel free to join us even if you didn’t participate in the first class. This knitting class is an intermediate level class and we will be focusing on learning to cable knit and read patterns and charts. We had a great time in our first session. We hope you can join us on Saturday. For more information, click here.